Rest-A-Back Backrest Light, Portable And Comfortable. Our new Rest-A-Back lumbar support backrest helps ease lumbar pain and backache and stays in place without fixing straps. Simply place the Rest-a-Back over the back of your chair and adjust up or down until maximum support is felt in your lumbar region. The simple counterbalance will hold the lumbar pain relief cushion in place so there is no need to keep adjusting it. 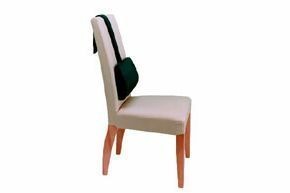 It is ideal to relieve lumbar pain and is suitable for home, office and car seats. The Rest-A-Back is light, portable and most importantly very comfortable. Made from hard wearing velour.